It’s been hard to find something to blog about the past couple of weeks. It’s not that I have nothing to say, but that my ideas seem unimportant when I think of all that has gone on recently. How can I write about Rosie acting defiant when a mother recently lost her two babies to Sandy’s force? How can I talk about holiday ideas for her when other families won’t be able to give their children a Christmas this year? I spoke to my friends and family about how I’ve been feeling. The other night, a friend said something that made me stop and think. “Sometimes [people] need to read happy things to take [them] away for a moment,” she said. I am not sure that anyone truly affected by the hurricane will or is able to read these posts. I am not sure that anyone will find them entertaining enough to use as a distraction, but with my friend’s comment in mind, I’ve decided to post as I normally would. If my words are able to provide a distraction for those suffering, than I’ve very happy to help. If people are not interested in reading my blog right now because too many other things are filling up their thoughts, I understand completely. Either way, here it goes. I found out that I was Rosemarie’s mother while sitting cross-legged on the brown and beige carpet of our Towneplace hotel room. The hours that followed were filled with tears, smiles, phone calls, kisses, and pictures. I was elated; I was relieved. But 12 hours later, that pure elation had turned to extreme panic. I sobbed on the phone with my mother and sisters, questioning whether or not I had done the right thing in becoming a mother. What if I wasn’t good at at? What if I screwed up? Only fifteen months later, I already know the answers to those two questions. I have years of work ahead of me, but I think so far I am a good mother. I spend my days with her watching Barney and Friends and Mickey Mouse Playhouse; I sit on the floor and build towers of wooden blocks. I keep her diapers fresh, her face clean, and her belly full. But I’ve also learned that I will and do screw up. I make mistakes, probably more often than I’d like. We don’t need to go into detail about the time she ate a hair clip. Yes, ate, swallowed, and digested a hair clip. I wish I had a picture of the X-ray to share: the gray silhouette of Rosie’s little spine, the top of her tiny pelvic bone and, then, clear as day, the bright, crisp shape of a metal snap clip. I will feel too guilty if I relay the entire story of the time I left the stroller open, knowing full well she liked to climb into it, and then heard a loud thump, ran into the room and found my poor baby bleeding from her gums. I will, however, tell you the whole story of the Cascade incident, which occurred only days after Hurricane Sandy right after we had returned home. I was cleaning up Rosie’s room, putting her books back in the their trunk and fixing the bedding in her crib, while she played in the kitchen. There is one drawer in which she is allowed to play; she opens it, removes the dish towels inside, and amuses herself by laying them over her head and piling them on top of each other. I made my way into the kitchen to check on her and noticed she had just spit up a large amount. Confused, I bent down to pick her up and that’s when my eyes met the Cascade packet. Its massacred body lay sprawled on the kitchen floor, its blue powdered insides spread out on the creamy tile. I looked down at Rosie and saw powder residue on her chin and clothing, and I knew what the packet’s fate had been: Rosie had eaten it to death. And the reason she was able to get to the packets is because I, her careless mother, failed to fully close the cabinet under the kitchen sink. The baby-proof locks are useless if you don’t actually close the door. Swell. I ripped open the package of water we had bought for Hurricane Sandy and attempted to pour sips into her mouth. 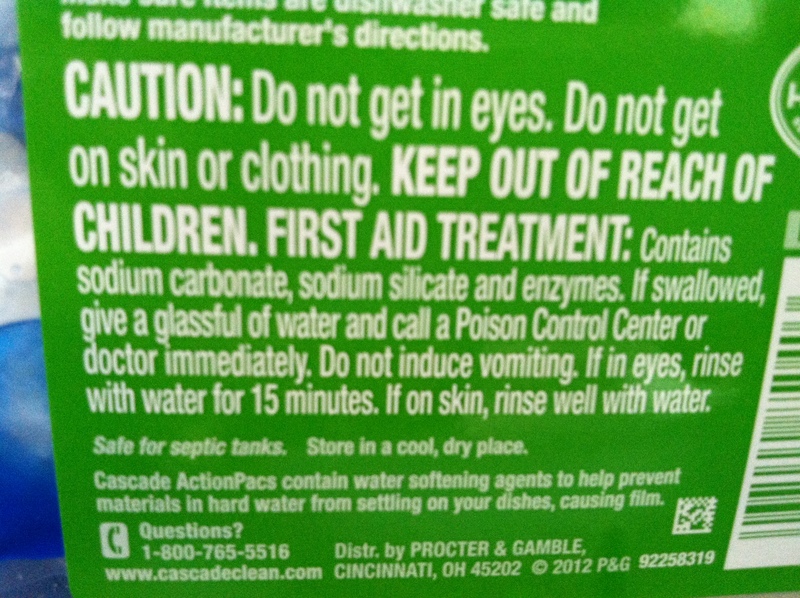 I mostly succeeded in soaking her pajama top and onesie, which I then had to remove as I dialed Poison Control. Alrighty. Keep in mind, this was only two days after Sandy had hit. I had not yet been on the roads, but I had heard Hylan Boulevard was moving like a parking lot. My only option, then, was to call 911. I wasn’t entirely comfortable doing this; I knew other people needed emergency service and I hated to take man power away from them, but what could I do? Now, remember, that I have a heart condition and I sometimes need to call 911 for myself. Usually, even though at these times I need to be seen in the ER immediately, I am not unconscious or anything like that. In the two years that we have lived on our block, I have probably called an ambulance at least five times and usually return home soon after looking perfectly healthy. So, imagine you are one of my neighbors, who has repeatedly scene the red flashing lights stop in front of our paved driveway. Now, two days after an unspeakable disaster has struck Staten Island, you see not only the ambulance arrive at my door, but also a giant, green and black camouflaged army tank, with two fully uniformed soldiers inside. Then, my mother (who had arrived by then), walks outside holding a laughing baby only to be followed by me, rushing out to the street snugly holding a container of Cascade dishwasher packets. Needless to say, I was humiliated. 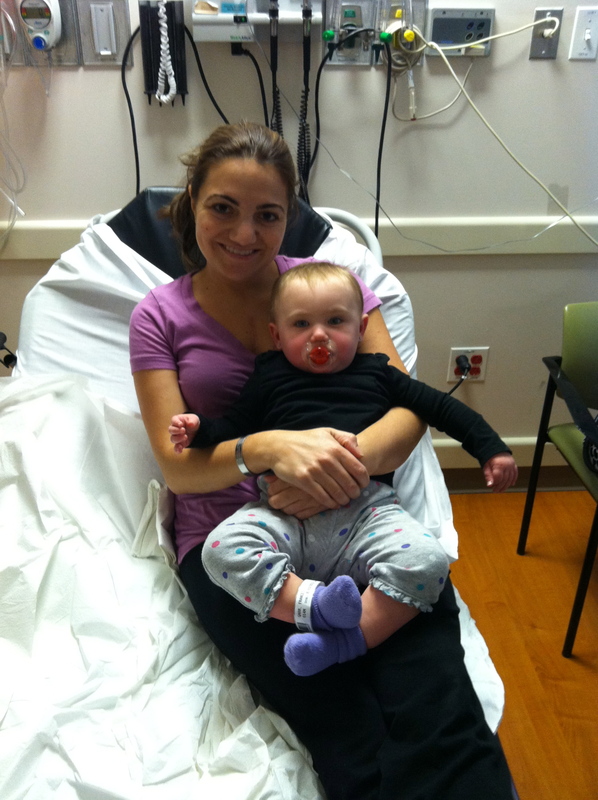 Rosie was seen quite quickly when we arrived at the ER. She slept on my lap as two doctors examined her and assured us that if she had been harmed by the soap she ingested, there would be some sort of symptoms telling us so. They researched the ingredients of the Cascade to be sure, but since they didn’t find anything, she was soon discharged and we made our way back home. My point of telling this long and embarrassing story is simply to say that I do make mistakes. No matter how careful we are, all of us moms will mess up. It doesn’t mean we’re not good mothers or don’t love our children. So, if you are an expectant mom, a new mom, or even a seasoned one, remember that you’re not alone in this. Just when you think you’re the worst mother in the world, you’ll hear about a mom who let her daughter eat dishwasher soap. What about you? What embarrassing mommy mistakes can you share? Don’t leave me out here alone, people. Thank you so much for reading, Sharon. I’ll do my best to sure you keep loving it. Lololol. “Rosie had eaten it to death”. Love it! You and Rosie are Priceless.. Keep writing your stories. I love to read about your adventures. I will, Gert. Thank you! Kim, your blog is heaven sent!!! You seem to answer every question, fear and random thought I have about being a mother! I love every minute of reading you words!!! Dina, I can’t thank you enough for that comment. Really! Thank you so, so much. I’m so glad Rosie is okay!! Don’t feel bad…I screw up at least once a day. I consider mom life as trial and error. Haha. I have heard that those dishwasher and laundry detergent packets are often being ingested by babies ad kids because they think they are candy! So I blame the detergent companies on that one. They should make their product less attractive!!!!! Very good point, Roseann! I blame them! Kim, your talent at writing never ceases to amaze me!